So of course I had too many pictures to put on here so I just chose a few. We had a great Christmas. The boys had fun and loved their new toys. 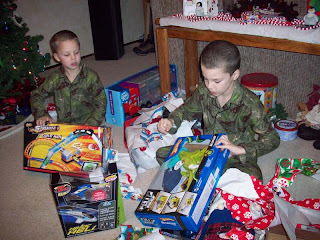 We had a Christmas Eve party at Maggie and Jasen's and then when we got home the boys opened their pj's from Grandma and Grandpa LeCeheminant. Ryan's internal woke us up at 7:00. We weren't ready but how can you sleep in when you soon have little boys climbing in bed with you all excited? It was all over with too soon though. It was nice, we enjoyed the family time. The Sunday before my mom was flown back to the hospital in SLC. She had to have another surgery to remove the blockage. The hard part was she in the hospital for Christmas. That was hard on mom and dad. But she is doing well when I talked to her today. She has eaten some solid food and that is a good sign. If she continues to do well then she can go home tomorrow. So excited about that. Thank you everybody that has kept her in your prayers. We are just hoping that she can have a bit of a break now. I feel like there is more that I was going to say but for the life of me I can't remember what it was. Snow and Too many Peanut Butter Balls! Since last weekend we have been getting snow. The schools were closed Monday, Tuesday and Friday. I, I mean we were lucky enough to get to go to school for the two days. Now were are out of school for Christmas break. Thursday night my best friend Jenny and I got together and made two batches of Peanut butter balls and 3 batches of No Bake Cookies. We were in the kitchen for 3 1/2 hours. It took 20 minutes to make the cookies and rest of for the Peanut Butter Balls. And it made TONS. Jenny took 1/2 and I got 1/2. I am proud to say I have only had 1. We made so many cause I was going to put them in some tins for the teachers. I had made Peanut Butter Blossoms and these pretzel things. And after all that we didn't get have school. So those Peanut Butter Balls are in the freezer and are not coming out until Christmas Eve! Yesterday I made some more No Bake Cookies and got started on the roll out cookies and chocolate crinkles. The roll out and chocolate cookies needed to chill for an hour. We ended up taking Brett to the Dr. for his sore throat that he has had for 4 days. We found out it is probably from drainage. Although he hasn't had a runny or plugged nose all week, so I never would have thought it was from that. But we got some medicine with codeine to hopefully help with the pain. After that we fixed dinner and I made the chocolate crinkles. Today we are going to finish the roll out cookies and then make Molasses cookies for Matt, the only one he requested. So a busy day today! So I was awarded the Christmas Spirit Award by Christa earlier this week. It is awarded to people who really believe in Christmas and the true meaning. You must be a true Christmas lover to accept this award.The person to whom you give the award must also be in love with Christmas. You must link back to the person who gave you the award. You must list 5 things that you love about Christmas. If you can’t limit it to 5 things, then keep going until you run out of space!Pass the award along to as many people as you like. That can be 1 or 45; it’s up to you. You must pass it on to at least one person in order to keep the Christmas cheer going. Let your recipients know that you have tagged them by leaving them a comment on their blog. 1. I love that Jesus was born and all that he has done for us. 2. The lights, I wish all the lights could stay up all year long. 3. The Christmas tree. Each year we and grandma and grandpa Freitag get the boys an ornament. It is so fun to watch the boys put their ornaments up on the tree. 4. family, we always get together with family and hear the story of Jesus' birth. 5. Watching the boys open their gifts Christmas morning. Trying so hard to be patient until they get to open them up! 6. All the goodies. This year we are making lots of goodies like we always did while I was growing up. or two and look at the lights. What a fun time. home from taking Ryan to the bus stop the other morning and noticed that there are still some roses blooming. Yesterday was beautiful and I went outside and trimmed, or as Matt would say, butchered the bushes. I noticed on a rose bush that we had cute little rose buds. It is December and still getting roses. Maybe that is why it was hard to get in the mood to decorate. It doesn't feel like Christmas time. It is always fun to get a bit of snow. We got some last year, but I don't think we will get some this year. Plus when we do get some here the schools close down and there is only an inch on snow on the ground. It is crazy. But it is nice not to have to worry about driving on ice. Always hated that. I can't count how many times I ended up in the gutter. Wait that makes it sound like I was a horrible driver. hmmm. But luckily dad always left after us to go to work and we knew that within 5 minutes he would be there to pull us out. Maybe that was why he left after us! So I have three strange boys. I was trying to get a picture of each boy and anymore it is so hard to get a good picture. Then Matt and that hat. It actually belongs to his dad. But several years ago it somehow ended up at our house. He wore it on the way to his parents house. traffic. But then I heard him say that he has worn it to work. Man I hope he was just joking. So it has been awhile so let me see if I can remember what has happened. We had a great Thanksgiving this year. We went to his parents house as we do each year. We didn't have as many people there this year and there was so much food left over. So we all got to take leftovers home for the next day. No complaining from anyone. We stayed until about 8 and headed home. The next day we just hung out and did nothing. That night my brother in law Terry and his friend Mike stayed with us. Terry's son Brandon plays for the Ducks. Saturday was the big Civil War game between the Ducks and the Beavers. So they came for the big game. Matt was wanting the Beavers to win and I was wanting the Ducks to win. And Ducks kicked some booty! 65 to 38. Not even half time Matt got up and went to play his computer! It was great. Even got to see Brandon on TV. Ryan thought that was pretty cool. Somebody he knew was on TV!!! Brett still didn't quite get it. It was a great game to watch. Then Sunday I did nothing. I started and finished a book. Picked up the house and then watched a couple shows and went to bed. This morning I started getting the decorations out. We got the tree up and a few things here and there. In our old house we had great places to put things and great places to put lights, here in this house there isn't as many places to put things. So I always take forever to figure out where to put things. Hopefully it will get done before Christmas. Me and decorating don't do well together. Maybe I will take some pictures tomorrow of the boys helping with the tree. I have been so horrible with taking pictures lately.